Halo design rings are made to enhance the beauty and charm of the centre stone. Halo engagement rings feature a centre gemstone surrounded by smaller accent diamonds. Halo design rings take their name directly from their shape; a circle of diamonds that surround a centre stone. In artworks, the halo has typically been used to signify enlightenment, majesty, power, prominence and divine influence. Christian artists often used the halo to mean the light bestowed by God. A traditional, romantic design, modern halo engagement rings retain the beauty and significance of these traditional symbols. The circular design of halo engagement rings is also a good symbol of all-encompassing support as well as the infinite and never-ending. First designed in the Victorian era, halo engagement rings gained their popularity during the Art Deco movement of the 1920’s. Halo design rings are a timeless design that have remained popular due to their romantic appeal and versatility. Halo design rings highlight their centre gemstone by surrounding it with diamonds, and they can often make the centre gem appear up to half a carat larger. Halo engagement rings can range from streamlined and modern to vintage and ornate, and double halo engagement rings can make an even more glamorous look. Halo engagement rings in rose gold are becoming a sought-after style due to their romantic look. Their current popularity has seen halo design rings second only to the classic solitaire design as the favourite style of engagement ring. Our team of experts at GN Designer Jewellers in Melbourne can help you design your very own custom halo engagement rings. If you bring us any imagery, ideas or inspiration, our designers can discuss with you the best way to bring your dream halo engagement ring to life. GN Designer Jewellers in Melbourne have expert designers and custom ring makers. White gold or platinum are classic choices for halo engagement rings, and yellow gold and rose gold are also popular, depending on your choice of stone and personal taste. You can also choose to pavé, that is, a setting of gemstones so that no metal is visible, or you can leave the metal of the shank bare. The number of stones on the shank should be equal on both sides, to create symmetry as per the vintage art deco look. You can discuss all your ring options with an expert jeweller at GN Designer Jewellers in Melbourne. There are many options when choosing the stone you wish to halo. A coloured or colourless diamond are traditional choices, though any precious gemstone can be set, and tanzanite and sapphire are popular choices. You have a choice in stone shape too, princess-cut and round centre stones are classics, but a halo engagement ring can contain emerald-cut, ovals, pear-shaped and marquise diamonds. For those customers on a budget, there is the option to do a cluster of small or pavé diamonds instead of a centre stone. You can often end up with the same carat weight of a single diamond, at a much lower price. We have more than 20 years of hands-on experience in jewellery making and design. We offer our customer’s meticulously handcrafted halo design rings created with care and precision. Our jewellers take the time to get to know you to create a unique piece, or, choose the perfect symbol from an extensive range of expertly handcrafted halo engagement rings. 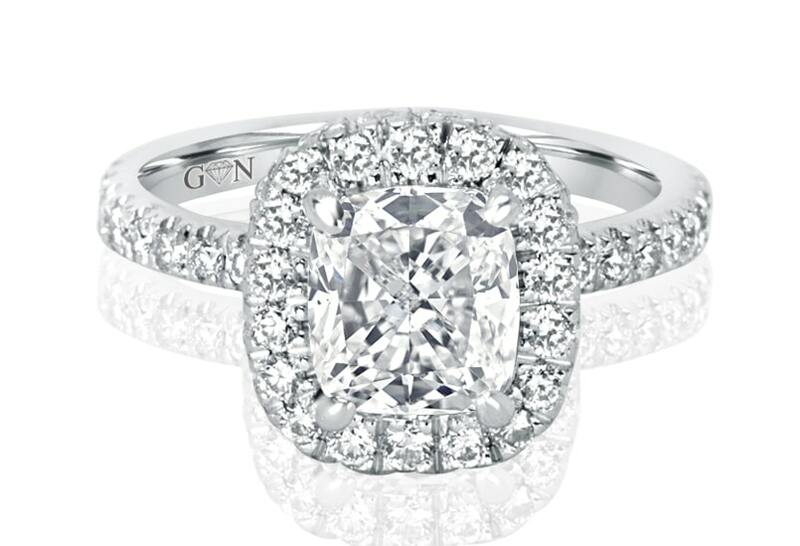 For more information about halo engagement rings in Melbourne, you can contact GN Designer Jewellers on (03) 9602 2153, or stop by our store located at 62 Hardware Lane, VIC Melbourne Australia.